Place onions and coriander in a bowl, cover with cold water, add 6 ice cubes, and place in refrigerator for 5 mins or until ready to use. Blend garlic, chilli flakes, and chillies into a fine paste. Add sugar, fish sauce, and lime juice, and continue to blend until the sugar is dissolved. Taste test and add more sugar, fish sauce, lime juice or pepper flakes to taste. 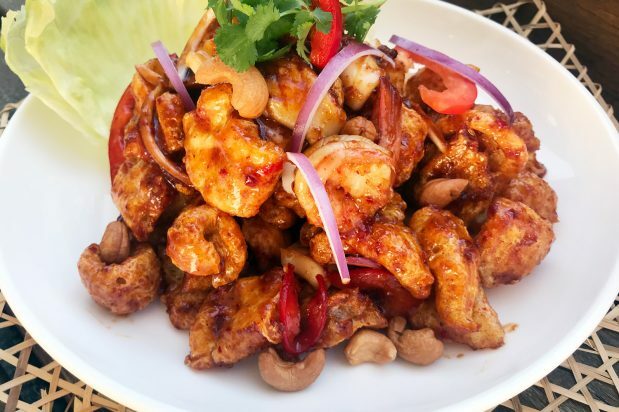 In a mixing bowl combine prawns, crispy pork skin, cashew nuts, tomato and blended paste. Mix through and transfer to a serving plate. Remove onions and coriander from fridge and drain. Garnish salad with lettuce, onion and coriander. Serve.